The provinces are interpreted as a result of separate and distinct magmatic and tectonic processes, primarily due to the 3 million-year age gap between the two episodes. However, there are numerous volcanic eruptive centers that have not been dated, so it is unclear if/how the provinces are related. Swenton’s research involves investigating the questions: Are the two volcanic provinces a result of separate and distinct processes? Is High Lava Plains volcanism associated with the Yellowstone mantle plume, a result of Cascadia slab rollback, or a combination of both? She is investigating these questions primarily by acquiring high-precision ages and detailed geochemical signatures of unanalyzed volcanic centers in the study region. If some ages come back between 15 Ma and 12 Ma, it is likely that the volcanic provinces are a result of a single, continuous magmatic process. If all ages come back between 16-15 Ma and 12-0 Ma, then it is likely that the two provinces are a result of separate and distinct processes. This study will provide additional insight into initial Yellowstone plume dynamics and the effect of initial Cascadia slab rollback. Vanessa Swenton is a second year doctoral candidate in PSU’s Geology, Earth, Environment, and Society Program. 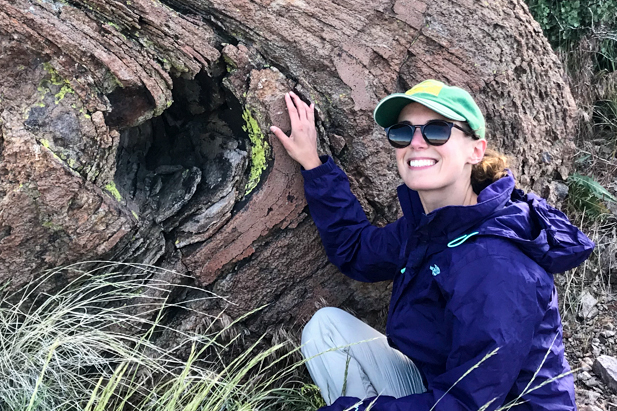 She has a Master’s in Geological Sciences from New Mexico State University where she worked on using field relationships and geochronology to evaluate the formation of the Schoolhouse Mountain Caldera, Mogollon-Datil Volcanic Field. She also has a BS in Earth Science with a concentration in geology from Central Connecticut State University, where she also completed the Secondary Education program to advance her goal of becoming a college professor and teaching geology at the university level.